In an industry increasingly fuelled by tech advances and which thrives off “disrupters”, co-wellness may just be the next big trend that directs the future of boutique fitness and health services. As we seem to keep peaking the dizzying heights of the boutique fitness craze and both local and international markets reach saturation of studio and service offerings, a diversion from traditional options is timely. As Core Collective, a sparkling and impressive, purpose built 23,000sq foot “co-wellness” establishment threw open its doors late last month, we look at how this latest tactic, offering shared spaces and resources, is pitched to shift momentum in the market, whilst supporting entrepreneurial minded allied health professionals, personal trainers and movement specialists. with fitness and wellness sprinting its way into the hot-desk, co-working space we’ve got to ask – is this the future of boutique fitness and health services? Targeting the growing number of freelance instructors and consultants who are aspiring entrepreneurs looking to launch their own business, co-wellness spaces bridge the gap between the need of a physical space to train or treat a client base and the prohibitive costs required, including initial capital outlay and barriers of long-term leases, that traditionally freeze them out of the market. Why work for someone, when now, with the introduction of co-wellness spaces you too can become boss, brand yourself and mitigate the risk potential? For sure, it is an appealing call to action. 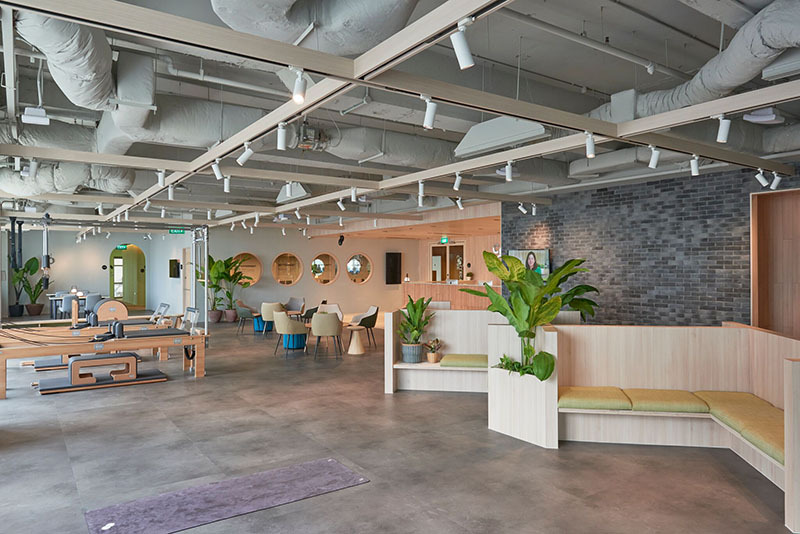 Co-Wellness was a movement sparked by the ingenuity of class-based subscription service platform GuavaPass who launched the first co-wellness space in Asia, GuavaLabs, in 2016, before subsequently expanding their offering into the OUE Downtown in 2017. Emma Harris, Chief Of Staff at GuavaPass outlines how they began this venture by offering 4 flexible rooms focused on Yoga, Boxing, Functional Fitness and TRX/Barre, creating a space which invited freelance trainers and established studios alike to have a new location to host classes and workshops. “The intention of GuavaLabs was always to be an incubator, a space where new wellness concepts could be tried and tested”, she explained. Bringing convenience, entrepreneurship and community to the local market, GuavaLabs initially catered to the fitness professionals who required space, but were perhaps not financially able, or interested, in the extortionate cost of their own location. The added bonus of this model was that the instructors had access to utilise the GuavaPass platform, with its 3,000+ Singaporean based users to assist in class bookings and referrals, maximising exposure and efficiently aiding marketing strategy. However, in staying true to its innovative reputation, GuavaPass evolved their offering, while simultaneously supporting the original co-wellness model. “In parallel with the co-wellness space, we launched STILL Boxing, Singapore's first aqua bag boxing studio. Once the STILL Boxing concept took off we opened two additional STILL concepts, Yoga and 30/30, within the co-wellness space.” Utilising their own market research, they were able to use the co-wellness space exactly as it was intended – as an incubator – and subsequently have diverted their main focus of the location to direct energy into their in-house branded concepts. “We now focus primarily on STILL and only allowing room bookings during off-peak hours. We continue to host wellness events at GuavaLabs for brands like Puma, corporate team bonding activations and allow freelance instructors to rent the rooms hourly", Harris disclosed. Core Collective, located on Anson Road in Tanjong Pagar, occupies no less than three floors, strikingly kitted out with bespoke spaces that encompass fitness and wellness offerings for the client to be both trained and treated in one central location. For the Aurum Group – the parent company behind Core Collective, this venture was not their first rodeo in the co-working space. After watching the success, benefits and flexibility of a co-working model in their existing company, Collision 8, they too wanted to offer aspiring fitness and wellness entrepreneurs a shot at launching their own business under the Core Collective umbrella. “We’re disrupting traditional gym and clinic models to empower self-employment of our residents”, explains Michelle Yong, Founder of Core Collective. Sensing moving public interest to holistic approaches and a potential market gap, in this first (with discussions of more spaces to follow) opening, Core Collective opted to highlight a “wellness” offering. Providing a space for the rapidly expanding number of allied health professionals; chiropractors, osteopaths, TCM practitioners, psychologists, nutritionists and physiotherapists, to share in the co-working model. Hence, we move from co-fitness to co-wellness. On the wellness level, you will find no less than 17 treatment rooms, 5 consultation rooms and 7 “premium” suites – designed exclusively for the private, sole usage of “residents” who are willing to pay the associated price tag of such luxury and a minimum 6 months rental contract. At 11,000sq feet this floor is a sanctuary for allied health professionals. Those renting out the space, be it long term, or on an ad-hoc basis, will benefit from services including reception staff, cleaning, towel amenities and payments processes all handled within the rental price. For the client, you enter a relaxing, thoughtfully designed space which invites a sense of immediate calm, where you can take your pick of reputable holistic professionals to assist your wellness needs. If you need to wait a while, or just feel like hanging out, the lobby area provides a soothing space to unwind. It’s fitting that the peak of this co-wellness facility is the climatic fitness arena, where busy city professionals meet their trainers to reach the topmost potential of their fitness capabilities. Whether its mind-body practices or HIIT-to-the max intensity, the fitness floor encompasses the entire range of athletic pursuits. Providing an equal balance of somatic bodywork practices and functional fitness, here you can find no less than 3 spaces for Pilates sessions (including tower and chair equipment), a boxing ring and a sweeping functional fitness floor, reminiscent of an F45 studio on steroids. Whatever your fitness tipple of choice, there will be a shot to suit your palate here. Fitness residents, similarly to the wellness contingent, have the flexibility to rent out spaces on a long term or ad-hoc basis, with varying studio sizes available to suit the needs of the class for group formats and an open, extensively equipped floor available for Personal Training opportunities. Core Collective proclaims that community is at the heart of the offering here. They clearly want to build a household of “residents” who come together to share their practices, and for the client, this means that their practitioners will be undertaking required continuing education to maintain impeccable practice standards and a sharing of skills and knowledge. Additionally, Core Collective is committed to assisting wannabe entrepreneurs set up their businesses here in Singapore. By aiding services including company incorporation, application of employment passes, shared admin, community networking, events and group marketing, Core Collective is aiming to support a growing industry by alleviating some of the confusion and again, barriers, that can limit the route into the sector for its residents. The benefit of this to the practitioner? It allows the professional to focus on their skillset – treating and training– without being distracted by logistical procedures and while additionally reaping the rewards of the associated business services offered. For the roaming freelancer who doesn’t currently have a roof over their heads, or perhaps does but wants to break free of the demands for long term leases, the appeal of flexibility, pay-as-you-go opportunities and tailored services for class/client demands is a huge draw card. The security of having a regular location, supportive environment and highly-engaging operations team, dedicated to helping you reach your highest level of success, is something not to be downplayed in an industry that can, at times, be very isolating as sole operator. For the practitioner with an existing clinic and client base, will they sign onto the Core Collective model? Maybe not. However, this isn’t necessarily the target market of the business. If it is an expansion of your services and convenience for CBD clients that could boost business, then the opportunity for ad-hoc hours, without long-term commitment is quite definitely alluring. As an integral part of business strategy, minimising the roadblocks between your service and a potential new client will assist in acquisition, leaving your professional skillset available for the all-important retention! It's of additional interest to note, that as they are opting not to partner with a third party, subscription-based platform, Core Collective is channelling major resources into marketing, to ensure they can best promote and elevate the exposure of their resident base, whilst sharing their incredible offering to the local client base. For clients entering Core Collective, prepare to be in awe. The space is particularly jaw-dropping, in both its immense scope of space and its bespoke fit-out. Offering a huge array of classes, treatments and specialist sessions, you can find just about everything you need here to stay healthy and well! You can definitely find yourself floating between the floors, moving from a sweaty bootcamp session, to a chiropractic adjustment, to a lunchtime meditation, and even nabbing a bit of shopping or a smoothie in between! Core Collective has devised a location which caters to the every whim of those looking for a holistic health solution in the CBD and for the client, well, you are guaranteed to be looked after here. Additionally, Core Collective is hosting a range of events in their Ground Level space, where you can find monthly panel salons from PAUSE, educational seminars, networking events and special, one-off workout sessions. Currently, a large proportion of the 27 pioneering residents sell their services through Core Collective’s group packages, which are priced at $30 and onwards per session and Core Collective is offering opening promotions with first trial sessions at $20 for fitness group classes and $30 for Pilates reformer classes (which is a real steal in Singapore!!). They additionally have 15% of all group packages for the month of April. Head here to check out the deals. So, is co-wellness really the future for boutique fitness and health services? As they say, time will tell! Within a local market that that enjoys the flexibility of a varied workout schedule and clients who move between boutique studios regularly, the opportunity for Core Collective to run a wide-ranging and tantalising-to-all-demographics schedule, is through securing highly-engaging freelance instructors, specialising in the current, most desired formats, under their umbrella. In doing so, they will hopefully sustain the captivation and interest of clients who no longer want to be tied down to a singular studio contract or gym membership, but would like the access to a convenient CBD location. On the wellness front – it is high time that we move more towards a model that supports inter-disciplinary sharing for the greater, holistic good of the individual. By having a network of professionals who can assess, treat and provide education for the entire breadth of allied health services, clients will have greater access to wellness protocols, minus the infuriating delay of trying to dash all across town to meet with specialists! In a society that favours speed, efficiency and convenience, we're betting on a striking success of this co-wellness venture – and undoubtedly you will spy us there! FOR MORE ON CORE COLLECTIVE, HEAD OVER TO THEIR WEBSITE. WHAT ARE YOUR THOUGHTS ON CO-WELLNESS SPACES? SHARE IN THE COMMENTS BELOW OR OVER ON SOCIAL!